October 1 - 6, 2018. Open to traditional and digital photographers of any experience level. Sorry. This workshop is full. Please email us to be placed on a reserve list. Shiprock and Storm, 1997. Near Shiprock, NM. Copyright © Lynn Radeka. Please join us for our 2018 Colorado-New Mexico photography workshop! Lynn Radeka and Ron Gaut will be hosting this photographic workshop open to all photographers, traditional and digital, of any experience level. Early October, even late September, is usually prime time for amazing fall colors in these two states. Truly a unique American West experience and photographer's paradise, the colorful San Juan mountain range of southern Colorado will dazzle the eyes with remarkable stands of Aspen in brilliant reds, oranges and yellows. This workshop will begin in the Ridgeway-Ouray area, near the colorful Dallas Divide. This area is noted for it's colorful vistas and high mountain scenery and is the home of the late actor Dennis Weaver. It's also the filming location of the original John Wayne movie "True Grit". We will spend a few days driving the scenic backroads and exploring colorful stands of Aspen trees as well as interesting ghost towns or mining camps. Lodging is available in the towns of Ridgeway and Ouray, and camping is available just north of Ridgeway. After 3 days exploring the Ridgeway-Ouray area, we will head southwest through the western slopes of the San Juans. We will pass the historic town of Telluride and continue south to photograph the ghost town of Alta and the quaint wild-west town of Rico as well as stunning colorful Aspen groves along the way. Continuing south, we will head into New Mexico and spend a morning and afternoon photographing the amazing Bisti Badlands, south of Farmington. Motels are available in Farmington, or camping south of Farmington at the main Bisti Badlands parking area. The last day of the workshop will end at the stunning landmark of the west, Shiprock. Camping is available, as well as motels, at the town of Shiprock, located not far from the iconic monolith of Shiprock itself. 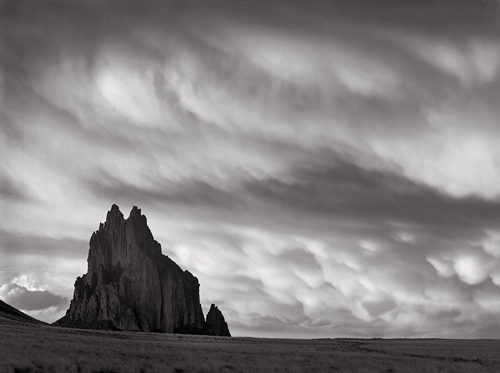 We will spend a partial day photographing Shiprock and the immediate area. Participants should feel free to leave at any time during the last two days if they have a tight travel schedule. Please note: The last two days of the workshop might be reversed in order to accommodate any participant's travel schedule (we might photograph Shiprock first, followed by Bisti Badlands later that day and the following morning). Please feel free to tell us your travel plans so we can best organize the last two days. 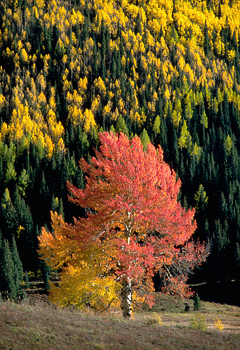 Aspen Forest, Autumn, 1980. San Juan Nat'l. Forest, CO. This workshop is open to all photographers whether shooting large or small format black and white or color, traditional or digital! Lunches during the day will be provided by Lynn Radeka and Ron Gaut, except for occasional indoor restaurant lunches, but each participant is expected to be self-sufficient with regards to campground breakfasts, campground dinners, or all indoor dining. Please inquire about any concerns or limitations. Lynn and Ron will be reviewing each day's shoot on a laptop computer and commenting on possible image manipulations and improvements. Contrast masking (for photographers shooting film) will be discussed as well as other traditional developing/printing methods. Digital photographers will enjoy the array of interesting software programs and techniques we may be demonstrating as well, including focus stacking for extreme depth of field and HDR for controlling extreme contrast. More importantly, the workshop flow will be largely determined by the needs and desires of the workshop participants, ensuring a very enjoyable experience for everyone. 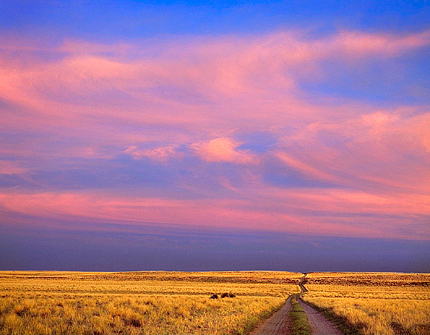 Road At Sunset, 1997, New Mexico. Copyright ©Lynn Radeka. Lynn will be handing out ClearWhite white balance filters to those photographers interested in digital photography, and durable cutout cards (an aid in visualizing compositions) to those shooting large format film. He will be assisting attendees in obtaining the best exposures and white balance settings using RAW format for those photographers shooting digital, and zone system methods, previsualization, exposure, development, view camera controls and selection of filters to those photographers shooting traditional large format. All participants will be given a discount code for products from ProgreyUSA (world class filters and filter holders). This photography workshop will also teach the use of contrast masking in your previsualization routine. This will help traditional photographers learn how to previsualize images with the intent of applying contrast masking (or other specialized darkroom procedures) to the final prints. Surprisingly, this often results in images being shot that otherwise might be passed up due to lack of local contrast on the scene or elements that aren't well separated from surrounding detail. The intended use of masking can alter the exposure and development given to the negative. Tag-alongs are not allowed on this workshop except for spouses, which will be required to be self-sufficient. This workshop is limited to six paid participants. Please see the signup details below. Influenced in his early work by Ansel Adams and Wynn Bullock, Lynn Radekas professional photography career spans more than forty-five years. His love of the grand landscapes and intimate details of the American West was born on his first trip to Death Valley in 1966. 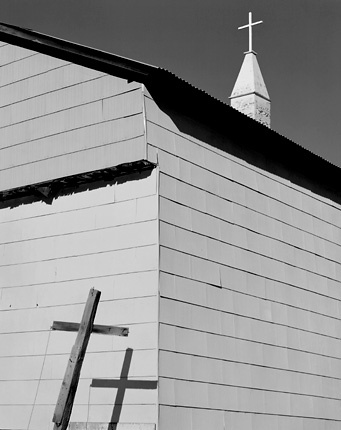 Lynn Radekas Black and White photography has been featured in eight National Park posters and several calendars including the calendar series Radeka: The American West and several ghost town calendars published by Browntrout publishers. In 1989 and 1990 he was commissioned to do the photography for five full-color books, resulting in a 2 year journey that took him through the back roads, historic places and ghost towns of the entire American West. Lynn also has the honor of being a featured photographer in the book publication "World's Top Photographers: Landscape" and has been published in B&W Magazine, View Camera Magazine and other photography publications. Lynn Radeka currently teaches workshops in Death Valley and Canyonlands National Parks, and Contrast Masking workshops in his home darkroom. He is the producer and co-author of the Contrast Masking Kit - a technical manual for traditional film-based photographers. Lynn feels completely at home using a 4x5 view camera for his film-based work and more recently a Sony A7R mirrorless camera for his digital work. Please visit the bio page of this website for more information. Ron Gaut discovered the outdoors at an early age and developed a deep passion for wilderness and photography. Not surprising, with Ron's 30-year engineering background and thirst to learn about photographic processes, in the early 1990's he began to experiment with many different films, developers, silver papers and alternative processes. He quantified much of his work by sensitometric analysis to determine the film/developer and paper/developer combination properties for different film and paper development methods, submitting the results as thesis papers at a local college. Influenced in his early work by Ansel Adams, John Sexton, Lynn Radeka, Ray McSavaney, and other contemporary "west coast" landscape masters, Ron traveled and photographed the southwest with his 4x5 view camera. Ron Gaut is an expert in digital techniques. "I enjoy the digital workflow. However, there is a steep learning curve to becoming proficient and printing your own work is essential." Ron uses Lightroom for global adjustments and Photoshop to fine-tune his images before printing. He has firmly established himself as an accomplished photographer and printer, receiving awards and accolades from critics and through photography competitions. Location: Beginning in Ridgeway, CO. Tuition: $1600. $800 Payment required in advance to reserve a space, remaining amount due September 1, 2018. Sorry, this workshop is full. Materials to bring: Cameras (digital or traditional), accessories (film, storage media, changing bags), camping equipment, gas money, campground breakfasts and dinners if camping. Contact: Lynn Radeka via e-mail for questions or more information.